UDON THANI:-- Police have arrested a gang implicated in the death of a 19 year old killed on Tuesday when he was kicked off his motorcycle in downtown Udon. The apprehended youths are members of the "Orcas" gang who have been marauding around the north eastern city's centre. 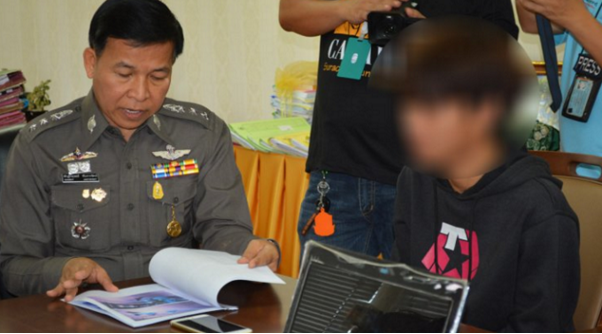 The seventeen year old gang leader has admitted to killing the man, reports Thairath. Meanwhile, the dead man's mother has appealed to police to do something to rid the city of the gangs and police have asked parents to keep their teenagers at home. Police announced the arrest of six gang members Friday aged between 15 and 17 and took four motorcycles into evidence. Chaiya Sidahaw, 19, was kicked from his bike on the Udon-Kutjap road on Tuesday fatally injuring his head on the sidewalk. Police said that the 17 year old leader of the Orcas gang had admitted kicking Chaiya but denied that gang members attacked him after he fell. The two groups of youths had fought with sticks near a college in the downtown area prior to the incident. A Udon police spokesman asked for parents and guardians to ensure that their children still on school holidays were not out in the city centre at night and warned that another incident may happen. Meanwhile Pranee Khaengraengdee,38, the mother of the dead man, called for police to rid the city of the gangs. In thanking police for tracking down her son's attackers she said that all the troublemakers should be rounded up in Udon. She said her son was the breadwinner of the family who was working hard as a panel beater and painter in the city. Police are still looking for other members of the gang involved in the incident. A lot of violence in Udon recently ? police have asked parents to keep their teenagers at home. Right, that should take care of it. Send them to re education camp , get those Army boys of their butts. That poor mum just lost her beloved son and means of support, yet is speaking out to keep it from happening to others. I'm glad they caught the guys responsible for this, I hope this is the end of it for that gang. 19 and supporting his family, what a great kid and a tragic loss. RIP to the young man and condolances to the family. Arrest all the gang members and lock them up for life, same with any other gangs. The police seem to know who they are but do nothing about it, why? Surely they are not scared of these thugs are they? They forgot to tell them to watch patriotic Thai and Korean soaps, sing the PM's songs in karaoke sessions and mantra-like recite the 12 core values. Return Koh Tao to its earlier life as a prison island and put them all on it. Stay at home warning really helpful, parents will not or cannot do anything hence the problems . Send them south to guard the borders 24/7 for 4 weeks that should sort them out and IF still alive bring back to serve life sentences for cold callous and calculated murder please do not forget the three injured will you . So, The gangs members are known but instead of locking them up ,the police tell the families of non gang youths to stay home so they wont be victims and cause more paper work for the bib. Thai society has gone to sh!t. I honestly don't think that the society and culture were ready for the modern World. I am sure the police will value your helpful advice. The problem is that in Thailand, like other countries, these junior hell-raisers have special protection simply because they are classed as children and the police have reduced powers to do anything that they MIGHT!!! ordinarily do to adult gang members. Youth gangs in Thailand are on the increase and the violence is getting worse. Can't see anything is going to change that. Which means that the cops can't even solve such a problem. A lot of people this age have to commute when going to school in another province, a short trip to a 7 Eleven for mom, having a gf a few km away, or anything else. I feel much safer now and feel very sorry for this boy's mom, the other relatives and friends. Should the Army show the cops how to solve this problem now? Our son is also 17. I can't even imagine how the poor boy's family must feel..
And the biggest problem's still coming. To understand that their son never comes back home. What a useless death of a young guy. Rest in peace. Did anything happen to the 2 or 3 Thais in Udon that smashed the German's head in with a hoe in the public park, to emulate the Koh Tao murders a year or so ago? Can't recall any follow up in the 'media'.